Mosul, Iraq – Most days in Mosul, Younis Ghanim wears a yellow vest and rubber boots, grabs a shovel and sets off to pick up garbage. It’s a small task in the massive reconstruction effort of this northern Iraqi city that for three years formed the capital of the Islamic State caliphate and was liberated by Iraqi soldiers in 2017. But it’s the kind of job that will determine the livability and the future of the city. “I want my neighborhood and city to be clean and beautiful again,” said Ghanim, who before IS earned a living selling clothing from a rack he pushed through the streets. That stopped under the jihadis because people had little money to spend. Now he earns 25,000 Iraqi dinars a day, just over $20, picking up garbage in a cash-for-work project sponsored by the ACT Alliance. He spends most of his salary on food for his expanding family – his second child was born in November – and diabetes medicine for his mother. Their home in west Mosul was completely looted during the fighting, and the walls lean perilously in the wake of the repeated air strikes on the neighborhood. But it’s home. “The biggest problem we face now is finding work. I looked and looked until I found this job, and I feel proud I can now earn money to buy milk and diapers to take home,” Ghanim said. The garbage collection project is part of a larger sanitation and community health program managed by Rehabilitation, Education & Community Health (REACH), an Iraqi NGO supported by Hungarian Interchurch Aid and ICCO Cooperation, both members of the ACT Alliance. “The people of Mosul are struggling to survive, and often don’t have time to clean the streets and communal spaces. Garbage is everywhere,” said Brwa Abdul Rahman, REACH’s acting program manager. REACH is helping the municipality fix its garbage trucks and acquire more collection bins and tools. It also carries out door-to-door needs assessment, yielding information it will share with city officials. Rahman says the cash-for-work element of the program is just as important as encouraging hygiene. “Most people still don’t have jobs or money. When we go door-to-door, although we ask questions about garbage, everyone asks us for jobs. They say assistance will eventually run out. But if we can get people jobs, they say, it will be more sustainable for their families,” he said. RNVDO is another Iraqi NGO supported by Lutheran World Relief, DanChurchAid and other ACT members. 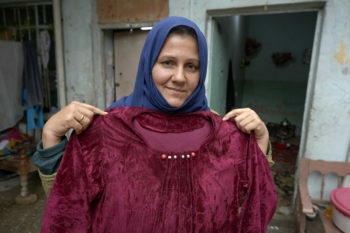 It helps Iraqi women with their sewing skills. Ekhlas Mohammad is one of them. She and her family survived the three years of IS occupation, though they were often hungry. One of her sons sold cigarettes to earn cash, but the jihadis caught him and beat him. During the final stages of the war they fled the city, living in a camp for displaced families for six months. When they returned home, their house was intact but empty, though she says there wasn’t much to steal in the first place. What they left behind was her old broken sewing machine. “I heard from my neighbor about the sewing classes, and I signed up with enthusiasm. I knew little about sewing, just enough to sew pillow cases. In class I learned how to sew blouses and pants, and I began to take orders from neighbors. They bring me the cloth, and I sew what they want. I only charge about 3,000 dinars (about $2.50) for a dress. I’m keeping my costs down to attract more customers,” she says proudly. A neighbor who’s a tailor helps her keep her old sewing machine functioning. Her new business has earned her new respect. “I love to work, and I feel proud to do so. Men respect us women more when we earn money for the family. And now I want to expand my business,” she said. 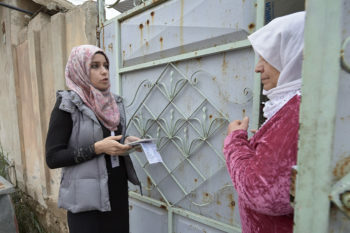 According to Omar Amer, a project assistant at RNVDO, helping women to earn an income is an important step in Mosul’s economic reconstruction. “On the west side of Mosul, it was just the men who worked before IS. A few women had jobs but not many. Now women have a new opportunity. We just need to give them a chance, and for them, working, it is a matter of pride,” he said. The recovery of Mosul is neighborhood-specific. On the wealthier east side of the Tigris River, recovery has been swift. Restaurants are packed and businesses flourish. 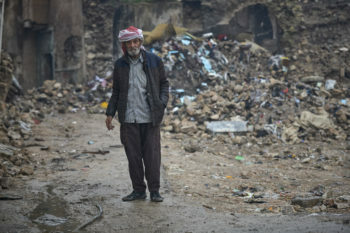 But in the western portion of Mosul, particularly the old city, block after block of rubble hide decomposing bodies and unexploded ordnance, the legacy of months of heavy fighting and air strikes as IS fighters made their last stand, often using residents as human shields. “They called it our liberation, but it was really our destruction,” said Hussain Ahmed, an Islamic teacher in the old city who has returned to live in the remnants of his heavily-damaged house. It’s also becoming clear that the so-called liberation is not over. Iraqi security forces continue to arrest IS fighters who have tried to blend back into the civilian population. The army has renewed air strikes against IS fighters who hide in caves and tunnels in the nearby mountains. The car-bombing of a Mosul restaurant in November served as a graphic reminder that IS isn’t totally defeated. RNVDO is working to undo the ideological legacy of IS by sponsoring after-school classes to help children catch up to their grade level. “During IS many schools were closed. Parents didn’t want to send their children to schools fearing IS. Many children were out of school for three years. When they went back they were automatically promoted from second grade to fifth grade, but they don’t know English, mathematics or how to write. All they know is the Islamic State,” he said. Twelve-year old Mohamad Omar Ahmad is one of those kids. He signed up for the catch up class in English as soon as he could. He can already read in Arabic, but wants to learn English so one day he can be a teacher. He’s glad the IS rule came to an end. “We couldn’t watch television or use a mobile phone, or play football. It was terrible. But now that’s over and we’ve got a lot to learn ,” he said. 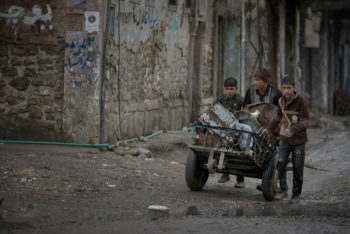 Some residents of Mosul are still unable to return home, either because their former homes were destroyed or they are worried about security. Some people commute back to the city every day, navigating through a maze of checkpoints ran by the police, the army, or the dreaded Hashed al-Shaabi militia where both Christians and members of the local Sunni majority are regularly harassed and threatened by the Shia militants. Hind Saffa Jijji, a Catholic from Mosul who escaped to Erbil before the takeover, hasn’t even gone back to see what has happened in her city. When IS was driven out, rather than returning to Mosul, Jijji relocated to Qaraqosh, a largely Christian town on the Nineveh Plains. “Our family still has a home in Mosul. IS families lived in it, but now it is empty. My father and mother went to see it. 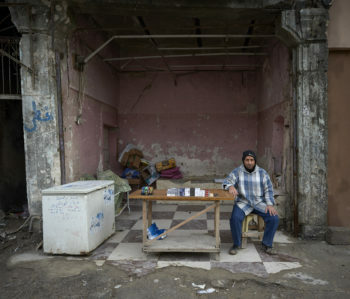 The house is still there but our furniture and all our things were stolen,” said Jijji, who manages livelihood projects for the Baghdad Women Association. But more than her family’s furniture is missing. The trust that once wove different faiths together into one shared neighborhood vanished during the war, when many religious minorities felt betrayed by Muslims they had considered their friends. For Iraq’s Yazidis, a minority that suffered genocide under the Islamic State whose women and children were subjected to the worst atrocities, the war is far from over. They continue to wait for the day they can return home, in the Sinjar region. Many are living in cramped settlements with other displaced people. One such camp is located next to the village of Dawodiya in the Dohuk province of Iraq’s Kurdistan region. Initially a camp intended for Christians, Muslims and Yazidis, after the liberation of Mosul almost all the Christians and Muslims have left, leaving behind some 600 Yazidi families. Although IS was officially defeated in 2017, camp residents say it’s still not safe to return home, nor do they have the resources to rebuild their lives there. Abbo Bobbi lives in the camp. Because he is a member of the Peshmerga, the Kurdish army, he recently visited Sinjar while on patrol. He pulls out his mobile phone to show a photo of his family’s house there. It’s a pile of rubble. “It was destroyed by air strikes. The Iraqi government is pushing us to return there but there are no schools, no houses and no money to build anew. And there’s no security. It’s not safe for us to go back,” he said. The Lutheran World Federation has contributed to building the camp. LWF hired camp residents to run a garbage collection service and maintain a functioning sewage system. LWF also drilled wells to ensure a supply of fresh water. Through the “women-friendly spaces” run by LWF the Yazidi women are learning skills that will help them earn money. Like many of the programs in the camp, it’s also open to residents of the host village. “Since we opened the camp in 2015, LWF has always been here, providing essential services and covering the gaps that the government couldn’t cover,” said Clara Gorial, the Dawodiya camp manager. Bobbi’s mother, Adlane Saido is one of seven people crowded into a modular housing unit with her son’s family.